Windows Vista introduced a new imaging stack, called Windows Imaging Component (WIC), and uses it in Windows Explorer to create thumbnails for most image file formats. Third-party software can use WIC codecs to support proprietary image formats such as Nikon NEF or Canon CR2 raw files, so that Windows Explorer shows thumbnails for these formats when the corresponding codec is installed. Microsoft maintains a page containing links to existing codecs. Sadly, there is no publicly available codec for the Photoshop PSD format but the newly released Microsoft Expression Blend 3 design tool (which, by the way, is nothing short of amazing for WPF and Silverlight design) includes such a codec so installing Blend 3 automatically installs the PSD codec. Download the Visual C++ 2008 SP1 Redistributable Package (x86). Install the VC++ Runtime by running vcredist_x86.exe from step (3) above. Copy PSDCodec.dll from step (2) to some location on the harddisk, e.g. "C:\Program Files\PSDCodec"
Register the codec from an administrator's command prompt by running the following command: regsvr32 "C:\Program Files\PSDCodec\PSDCodec.dll"
That's it, Windows Vista Explorer should soon begin to display thumbnails for all PSD files that were saved from Photoshop with the "Maximum Compatibility" option. As a side effect, WIC-aware image viewers such as FastPictureViewer Professional automatically benefit from the codec installation and uses it to open and display the same PSD files with full fidelity. Update: Interestingly enough, new versions of FastPictureViewer ship with their own codecs that Windows Explorer will pick up automatically so that PSD files and other image formats not natively supported by Explorer are displayed in the file manager after installation. A free alternative that you may use is Pictus. It has not been updated for a long while, but it integrates PSD support in Windows Explorer even on newer versions of Windows provided that you make sure the option is checked during installation. Last but not least, there is the free SageThumbs which does the very same thing. 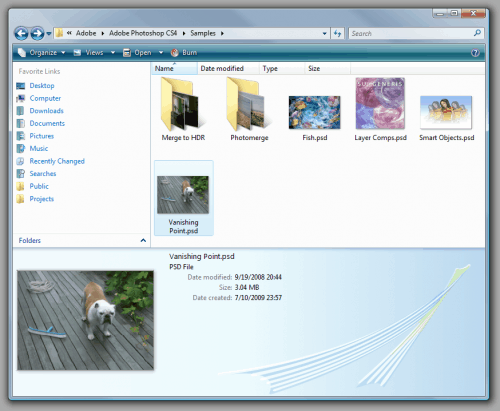 Find out how to display Photoshop PSD thumbnails in Windows Explorer on all supported versions of the operating system. Nice tips, but requires to download a big file for a little purpose. Nice trick. Do you have any idea how to get thumbnails for Quicktime? @Martin, @JK – We could also try ThumbView Lite, which is just ~500KB, and supports over multiple image types. Does not work – tried on Vista 64 – does nothing. All PSDs saved in max compat mode so its not the files. Windows is a pathetic abortion – going Mac next time. Yeah, as proven by their lack of features in the iPad/iPhone – Flash, accessable battery, etc.. Great point! A 64 bit solution is in the works. US$ 20 for having PSD thumbnails is borderline a scam. David: Do you have an estimate as to when the codec from Microsoft Expression Blend 3 will support 64bit? @Aakash, I don’t have any idea: you’ll have to contact Microsoft about their codec. The Ardfry PSD codec works just fine on 64 bit Windows. Mystic Thumbs does the job on x64. It has a x86 version, but it isn’t as good as this psdcodec system. But when it comes to x64, this free codec works great. This worked great on my Windows7 machine. Instructions for getting to an administrators command prompt couldve been more detailed: type cmd into the search area from the start menu, then right click on the program cmd.exe and select run as administrator. It also couldve been easier if you simply included a link to download the 254kb PSDCodec.dll (instead of having to download the 71mb trial version of blend). Followed the steps – works great! Thank you! You saved me some much precious development time that would have been lost opening psds to check the exact content. Works a treat on Windows 7 professional! Hi, a good solution for 32bit and 64bit Windows7 is SageThumbs! I found the solution that works for me – Windows 7, 64bit, Photoshop CS2. I downloaded an older Photoshop 7 free trial. Both 7 and 8 are freely and legally available from many websites. The trial doesn’t even open on my windows 7 but by installing the older version, all the code to view psd thumbs on your computer is installed in the background. This Includes thumbs view in IE and Photoshop. Here is a simple way to get thumbs to view after you install a free trial of PS: Begin by opening your files from your normal Photoshop and wait for all the psd’s thumbs to view. Once all your thumbs are visible in all of your folders opened in Photoshop. IE will now recognizes them also. Tip: If you use C Cleaner to clean your computer from time to time. Open C Cleaner, go to Applications/Windows explorer and un-tick Thumbnail Cache check box. Saves repeating the whole ordeal of re-opening thumbs in Photoshop after cleaning. Even after the trial expires, Thumbs continue to work. The code is there.